In the village of Beddgelert a bronze statue commemorates the tragic tale of Gelert, a prince’s dog. The story of Gelert is a variation of the “faithful hound” myth that appears in many countries including India, Malaysia, and Egypt. A pair of headstones—one in English, the other Welsh—relate the tale. 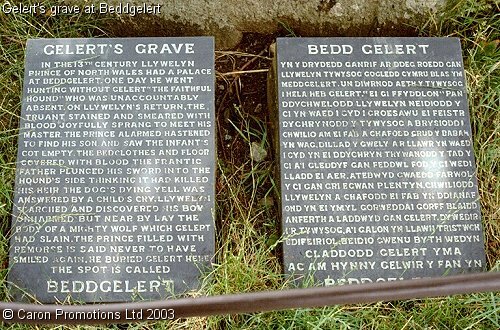 According to lore, the word Beddgelert translates to Gelert’s Grave; however, other research indicates the village was named after a saint. Apparently, the grave was a late 18th century marketing ploy devised by a hotel landlord whose business needed a boost. This was written by SF. Posted on Monday, April 5, 2010, at 1:27 am. Filed under Myths & Legends. Tagged Beddgelert, faithful hound, Gelert, Gelert's grave, legend, myth. Bookmark the permalink. Follow comments here with the RSS feed. Post a comment or leave a trackback.